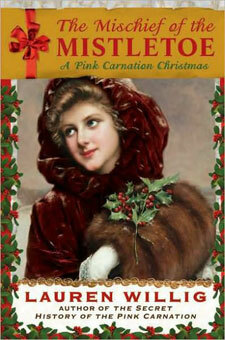 Beatrice.com » Come to the Lady Jane’s Holiday Salon! Come to the Lady Jane’s Holiday Salon! On the first Monday of every month, I emcee Lady Jane’s Salon, an evening of readings by romance writers in the upstairs bar at Madame X (94 W. Houston St.), and tonight’s event is fraught with holiday significance. Our guest authors will include Lauren Willig, the bestselling author of the “Pink Carnation” series of historical romance/espionage novels, who’s just published The Mischief of the Mistletoe, a Christmas-themed romantic comedy which draws upon both Jane Austen and P.G. Wodehouse for its charms. She’ll be joined by two of the contributors to the A Harlequin Christmas Carol anthology, Jacquie D’Alessandro and Hope Tarr. You don’t need to RSVP to attend, but if you are on Facebook, you can certainly check in so we have a rough idea of the audience. If you’re in the New York City area, and you like romance fiction, this is always a fun opportunity to get together with fellow fans, and I’m sure tonight’s salon will be especially festive. I’m looking forward to celebrating with several of Lady Jane’s long-time friends, and to making new acquaintances as well. See you there?